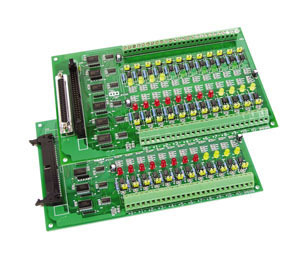 The OME-DB-24P is a 24 channel isolated digital input daughter board for OME-PIO-D144 digital input board. The optically isolated inputs of the OME-DB-24P consist of a bi-directional opto-couples with a resistor for current sensing. You can use the OME-DB-24P to sense DC signals from TTL levels up to 24 V. You can also use OME-DB-24P to sense a wide range of AC signals. The OME-DB-24P registers a constant logic high if the frequency of the input AC signal is greater or equal to 1 kHz, and if the voltage of the AC signal is at least 4 Vrms. If you are using an AC input signal, you must short the AC filter jumper. You can use the board to isolate the computer from large common-mode voltages, ground loops and voltage spikes that often occur in industrial environments. 참고: Each board is supplied with complete operator’s manual on CD ROM.